Can a beautiful new home fit in to a beautiful old neighborhood? These homeowners think so. HERNDON/RESTON — Upon stepping in to the model at Shaker Knolls off Shaker Woods Rd. Karla Cook told the Washington Post in a recent interview, “Well, I walked in and said ‘this is it.” And homeowner Anjali Lipman was taken by the setting. In the same Post interview she said ” It’s really beautiful back here. Less suburban, less crowded…”. As much as CarrHomes would like to take the credit for both the land and the homes, the Shaker Knolls site with its tall trees and stream was here long before we designed our nine homes to blend in. The great benefit of purchasing a new home in a popular old neighborhood like this one is that it’s an opportunity for long-time neighborhood residents to move into a new home that better addresses their changing needs without having to move away from the friendships or nearby conveniences like those found at the nearby Reston Town Center. There is only one, final five-bedroom home for immediate delivery on nearly an acre of land at Shaker Knolls. It’s a spectacular, fully customized, 7200 sq. ft. residence with 3-car garage, priced at $1,399,900. And when it’s gone so will the opportunity to own new in this beautiful old neighborhood. 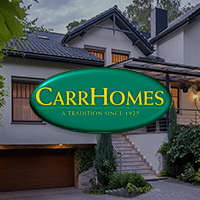 Click onto carrhomes.com or call 703-598-3095 for more information.